ESA and NASA are both planning small Flagship ($1-2B each) rover missions to explore Mars in 2018. The agencies have recently decided to merge their efforts to pool costs. As plans stand now, NASA will provide the launch vehicle and a skycrane entry-descent-and landing system. Each agency will provide its own rover, which will be simultaneously delivered to the same location by the skycrane system. They idea of sending two rovers to the same location has caused a lot of raised eyebrows (to put it mildly) at Unmanned Spaceflight. In this blog entry, I want to explain why this isn't necessarily as stupid as it sounds and to discuss what I think may eventually happen. NASA's 2018 MAX-C rover has a primary task of selecting, acquiring, and caching samples for a potential future Mars sample return mission. The system to acquire, handle, and store the samples is quite complex and heavy (tens of kilograms). As a result, there is insufficient mass and space for a suite of internal instruments. Instead, the mission proposes to have a set of highly advanced contact instruments on a robotic arm. Unlike MER and MSL, these instruments will be able to study micro-variations in composition across the contact point much as might be done in a terrestrial laboratory with a sample. The instruments can examine the contact area in multiple spectra, measure elemental and minerological composition, and measure organics (if present). The instruments are potentially light, perhaps 15 kg (probably not including the robotic arm, although the presentations are not clear on that point). Currently, many of these contact instruments are in a low state of technology readiness, but with nine years to flight, there's time to address that issue. ExoMars also will carry a ground penetrating radar and a power wide- and narrow-angle camera system. MAX-C presumably would also carry a capable imaging system and tentative plans have it carrying a spectrometer on the mast for remote identification of surface composition. No single rover can do it all. If you want to sample deep beneath the surface, have a sophisticated laboratory of instruments inside the rover, have sophisticated contact instruments, and acquire and cache samples, you need multiple rovers. Flying ExoMars and MAX-C to the same location would provide complimentary, not redundant, measurements. If budgets or landed weight limits restrict the 2018 to a single rover, what I think would be compelling would be to add an arm with micro-scale contact instruments to an ExoMars rover. The arm and its instruments would be relatively light (20 - 25 kg?) become a complete subsystem that can be developed and supplied by NASA, simplifying the development interfaces. 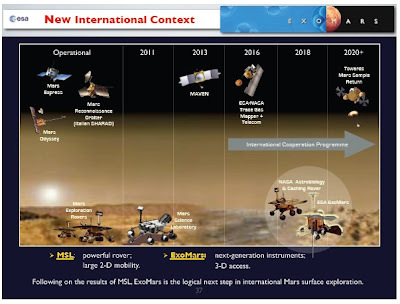 In the best of all worlds, I would advocate enhancing ExoMars with the MAX-C arm and instruments for 2018. 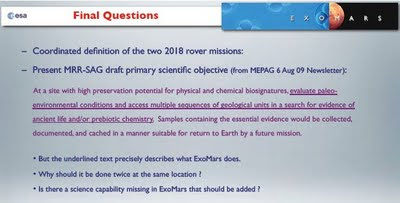 Then I'd fly MAX-C in 2020 with its arm and instruments and caching to either the same site (if ExoMars finds compelling reasons to make it the site for a sample return) or to a new site (or possibly the Mars Science Laboratory site if it is the compelling site). All it takes is money. 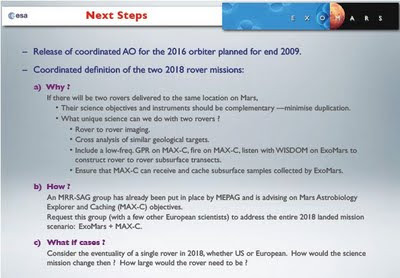 As the following two slides highlight, the question of how to merge the two missions is one the two space agencies are wrestling with. 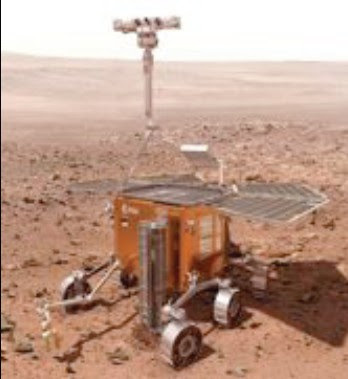 For hours I have been looking and reading other articles about Two Strategies for Mars Rover Instruments.